While a stick letter’s main purpose is simply to stop refunds (thus make the sale ‘stick’), or in continuity, delay the cancellation and keep membership intact, it certainly can go beyond that, as you’ll see in this month’s example. This comes from Kevin Lane, and we used a bag of shredded money. We’ve been doing a lot of work with Kevin and adding our creative and unique direct mail steps to his Infusionsoft campaigns. If you’re interested in adding automated direct mail steps to your Infusionsoft campaigns, we should talk. Call Tara at 888-250-1834 and tell her to schedule a 30 minute call with Travis regarding Infusionsoft direct mail integration. This is one of those steps, a letter designed to be sent once an appointment is set in order to keep, or stick, the appointment. Many smart marketers use very elaborate multi-step, multi-media (mail, email, fax, phone, etc.) stick campaigns. At a minimum, you should have something. If you have refunds or cancellations of any kind you can likely decrease that number with a simple stick campaign, much like the letter seen here that I wrote for Kevin. Gary Halbert, perhaps the greatest copywriter of all time. 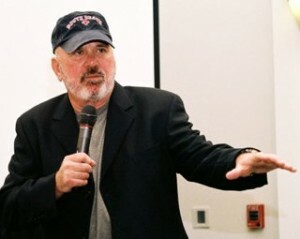 A great “stick letter” is one from Gary Halbert many moons ago. Go see a copy of it here. I encourage you to go and print and read the letter, and then come back and finish this article. It certainly grabs your attention out of the envelope. Even though you’re not selling anything in this letter, it is still absolutely necessary to grab the reader’s attention. In Gary’s letter, he immediately addresses why you’re getting the letter, and why you’ll be getting the newsletter. This stick letter is a little unique in that the subscription was a gift from a friend of the recipient. If this were your standard stick letter, you’d want to list everything they are going to receive (or have received already). People often buy on impulse, at the grocery store, online, and yes, even your products/services. They could be having doubt and/or remorse after purchase. Your job is to get them to back away from the edge and reassure them of their smart decision. Many often buy without knowing exactly what they purchased to begin with. This again gives you a chance to re-sell the buyer on their decision. Next, he covers why you should care and why you should read. It may sound like blowing your own horn, but that’s what you have to do to reinforce the purchase. Then, he lists a small sample of “insider secrets” revealed in the newsletter(s). The se are very good bullets. Each could be used as a standalone headline in any marketing format. Are your bullets this good? Could they stand alone on their own? These can. If you sent out a marketing piece with just the bullets and a response mechanism (visit a website, call a toll free number, etc. ), would people contact you? That’s how you need to go about crafting your headlines and bullets. There’s also an assault on their “manhood.” It tells you specifically WHO is letter is for and furthers the sense of belonging, the “this is for me” reaction. It also says specifically who should NOT be reading this letter, and tells them to leave… NOW. Let’s go back to Kevin’s letter which you can see here. As mentioned, this letter is sent after an appointment is booked, but before the appointment has occurred. 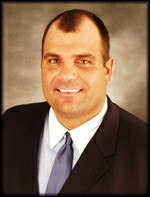 Kevin Lane, founder and owner of Lane Family Financial. In Kevin’s case, there are often weeks in between the booking and the meeting, and we want to be sure they show up prepared for the meeting. This is just one step in the campaign; there is one other direct mail piece (depending on how much time is between booking and meeting), a few emails and an outbound phone call the day before. If you sell by appointment just booking it is not enough, you’ve got to get them to show up. Your appointment really starts the minute you schedule the time with your prospect! Also in Kevin’s letter we don’t simply say, “Here’s your appointment time and date, make sure you show up.” We twist the knife; we poke and needle the pain points. Again, it’s not enough to have them make an appointment; we want them to KEEP the appointment. Like the Halbert letter linked above we spend very little space on the “product” itself (the appointment) and spend most of the space reiterating the discomfort of the situation and how they will feel after the result, which Kevin guarantees. We also make the big, mean, money guzzling banks out to be the “bad guy,” a common theme throughout our marketing efforts to his leads. A “common enemy” subject is a tactic we often use, with great success across many different industries. Remember, make them stick and KEEP their money! 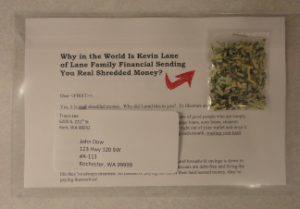 Get 15% off the shredded money mailer when you enter promo code shred15 when you checkout. See the shredded money and visit this link to get more information and to order. You can also call 888-250-1834 to place your order, 8AM to 5PM Pacific, M-F.
Be sure you enter the promo code shred15 when you check out to get the 15% off discount or call 888-250-1834. See the shredded money here and order today.